When you graduate from nursing school and emerge from the experience with your license and new credentials, knowing what to expect may seem like somewhat of a mystery. Many questions will plague you as the daunting task of entering the profession becomes real. How will you navigate these new career waters? Do you know enough to actually practice safely as a nurse? Where will your support come from? Who will be your allies and mentors? Will anyone hire you? Everyone experiences these jitters, and the reality is that some new nurses’ entry into the profession is smoother than others’. But since you survived nursing school, you can survive this too. One realization that many new nurses face is that they have a whole lot to learn. Becoming a nurse doesn’t stop when you graduate and take the NCLEX. You need to continue to learn, grow, expand your knowledge base, and develop new skills. A great deal of learning happens on the job, of course. The hope is that you’ll have supportive colleagues who help you get acclimated. 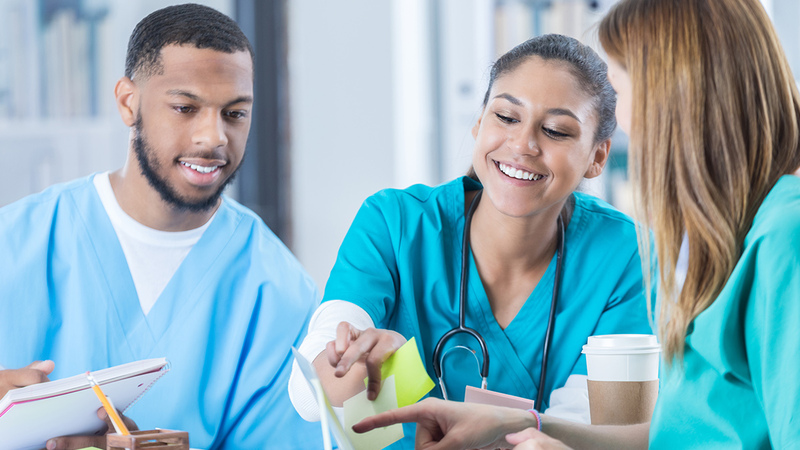 If you’re lucky, your employer may assign you an official mentor or preceptor, or maybe you’ve been accepted into a new grad residency program. No matter the situation, essential learning takes place. See your more experienced colleagues as valuable resources and reach out to them for what you need. In fact, one of them could become your unofficial mentor if you have the courage to ask. As soon as you become licensed, it’s important to pay attention to continuing education requirements in order to maintain your license in good standing. There are plenty of ways to earn CEUs, including sites like NursingCE.com, as well as live conferences and seminars. Your first two years are all about getting your feet wet, continuing to learn, and being a total sponge for new experiences, skills, and knowledge. Being a nurse martyr is no fun, but it’s all too common. Remember that taking care of yourself isn’t just important, it’s non-negotiable. Nursing is demanding, and the importance of proper nutrition, hydration, rest, and exercise can’t be overstated. You also need to make sure you get time to do the things you love, socialize with friends and family, and spend quality time away from work. As you settle into a new routine as a professional nurse, you also need to create a new routine for self-care at home and at work. Your nursing career won’t magically grow without some input from you. Doing well by your career should be top of mind, and that includes having an updated resume at all times, a robust LinkedIn profile, a plan for professional networking (including your own business card), a desire for ongoing learning, and a vision of what you want in the short-, mid-, and long-term. Many people sit back and allow their careers to just happen to them, but proactive, forward thinking nurses take the bull by the horns and create the career they want. Asking questions, doing research, requesting informational interviews, and putting yourself out there is essential. Great careers are created by those willing to do the work. This can mean getting certified in a specialty, volunteering for committees at your workplace, or finding other ways to expand your horizons. In the first two years of your nursing career, things may not work out exactly as you had planned. The area of practice you were interested in may no longer seem so compelling, your first job may be less than successful, and you may feel like you have ten thumbs. Your career will hopefully be quite long, so don’t sweat it if things fail to come together quickly. Your career doesn’t happen in a vacuum – it’s impacted by many forces, including your way of life, the economy, the job market, and many other factors. Your plans for your nursing career may have seemed great when you were graduating from school, but real life can get in the way and your plans may need to change along with your personal circumstances. Your first few years of being a nurse can be exciting, maddening, frustrating, exhilarating, and ultimately satisfying. Keep your eyes wide open, read the writing on the wall, be flexible, and maintain a positive attitude. The force of your motivation and ambition will see you through the hard times and elevate you even higher when things are going well. Enjoy the process and remember that you can eventually be a nurse who novice nurses look up to as a role model of what a smart, inspiring, savvy, healthy, and thoughtful nurse can be.